In our junior high and high school, each grade has Bible class four days per week, and chapel one day per week. Many of our Bible classes are taught by the associate pastors of Hilltop Church, men who have been a godly influence on many young people. We have chosen BJU Press for our math curriculum in order to develop the students’ reasoning skills and to insure that they are well prepared for college-level math. In English, our junior high classes utilize the A Beka curriculum to provide a solid foundation in grammar, research, and writing and to help students appreciate good quality literature. Our high school English classes use the BJU Press curriculum and additional teacher-designed writing instruction to further develop critical thinking skills and to prepare students for the rigors of college reading, research, and writing. Science and History are taught from a biblical worldview. Our college-bound students learn more about the world around them through chemistry and strengthen their problem-solving skills in physics. 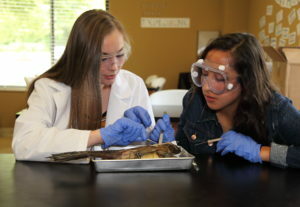 Hilltop’s high-level science classes employ rigorous standards and emphasize a biblical worldview that equips students to enter the arena of scientific debate. Social studies courses expose students to a range of topics in history, civics, geography, and the humanities. Students learn a factual account of history that is free from revisionism. Studies in civics and the humanities help students to master skills in critical thinking and ideas in responsible citizenship. Technology has become a part of everyday instruction in our classrooms. Our teaching methods utilize technology to increase the level of interaction in our lessons, and class projects integrate Word, Excel, and PowerPoint. Students have access to an updated computer lab that can be used for research, completing class projects, or taking online classes. HCS gives students the option of purchasing e-textbooks or printed textbooks; this option allows students to choose which best fits their learning style. In addition, computer application classes are offered as electives, and student may also choose to take online technology courses upon request. Our graduates have been accepted at many colleges and universities, including the ones listed here.